Are you ignoring one of your prospects’ favourite ways to get information? This is a guest post from Carl Friesen, an author and consultant who shows businesses how to grow their visibility and credibility by getting published. Carl's article will be particularly helpful to those trying to get through to hard-to-reach senior executives. For any professional firm that wants to make a name for itself as a thought leader, there is huge pressure to provide evidence of its expertise online. Blogs, YouTube videos, a website that is a must-visit for people in their market … but is your firm ignoring a technology that is among your prospects’ favourites? The online media have been talking about the “death of print,” and in particular the demise of mass-market magazines and newspapers. But print lives. Print magazines are popular with advertisers, who like a high-impact, can’t-ignore way to get their messages in front of readers. Readers like it too — as can be seen in the continued popularity and even growth of many specialty magazines. So, why would your marketing strategy ignore such a popular and effective vehicle? Printed magazines are particularly good for reaching niche markets — often, trade publications are one of the ways senior executives stay in touch with the trends that affect them. Consider a firm that seeks to demonstrate its expertise to the international mining sector. 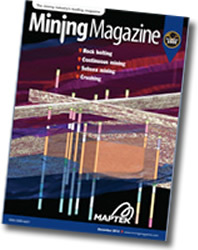 Of the half-dozen major trade magazines reaching this market, one of the most influential is UK-based Mining Magazine. While its readership of 23,000 is small compared to many publication giants, its readers are highly influential. Think about it — who would read a magazine devoted to mine ventilation, ore processing and tailings management? People in the industry with budgets to spend, that’s who. We see this in the advertising rates that such magazines charge — £6,795 (US$10,570) for a double-page spread. Many advertisers buy multiple insertions annually, year after year. Is this “stupid” money or “smart” money? Are all those people stuck in the Jurassic era? I don’t think so. And … you don’t have to spend that kind of money to get your message in front of the world’s mining magnates, or other powerful industry body. Editors of Mining Magazine (and similar arcane titles that you won’t see on any news-agent’s shelves) are always on the search for good content. “Good,” for them, means content that is targeted specifically for their readers, is well written, and most important, does NOT come across like a sale pitch. Editors depend on having a steady flow of articles, written by outside experts. A typical trade magazine contains some “real journalism” articles, written by staff writers or freelancers. They have some adverts and ‘advertorials,” which are really just copy-heavy adverts. Then there are the “contributed articles,” “expert-written articles,” or “special reports,” contributed by people who are not usually professional writers, but have expertise to share. Generally, it’s a no-money deal — the publication doesn’t pay a freelance fee, and the contributor doesn’t pay an advertising fee for the space. I’m aware that some magazines try to get contributors to buy some advertising space. If you’re told to buy an advert for your article to be published, that’s your cue to say “thanks but no thanks” and go on to one of the vast majority of publications that doesn’t charge. Editors like expert-written articles because it’s a chance provide leading-edge information to their readers, and most important, they don’t need to dig into their freelance budgets. However, any reputable editor (and the other kind don’t keep their jobs long) will be death on anything that sounds like a marketing message in the article. And really, you don’t need to “sell” through what you write — just demonstrating the expertise your firm offers is enough. Some editors will allow a contributing writer to add her or his contact information, credentials and the name of the organization. Others only allow minimal information, which to me limits the effectiveness of the article from a marketing perspective. Any publication worth the name has an online presence, generally in the form of a website that forms a dumping ground for all the news that it can’t fit onto its pages. Some of these have evolved into online communities, must-visit online sites where people in a specific market stay up to date on developments. Going to the effort of having your content accepted by a magazine, and then published, is worth it in many cases for the SEO benefits alone. Your content gets more traffic, and has higher credibility with search engines, if it appears on a magazine’s website. Sending a reprint of an article, rather than just a white paper, is another way to boost the credibility of your ideas. Potential clients are well aware that a magazine’s pages are limited in number, and if the editor thought your idea worth printing on some of those pages, it boosts the credibility of that content. Sure, you need direct-to-online content as well, and it needs to go beyond text to video, audio and infographics. But print publication is a great way to reach a niche market and amplify your message, while boosting its credibility. Carl Friesen is Principal of Global Reach Communications Inc. helping business professional firms stand out and get noticed through publishing their ideas. See www.showyourexpertise.com, or contact carl@showyourepertise.com, 1.289.232.4057.